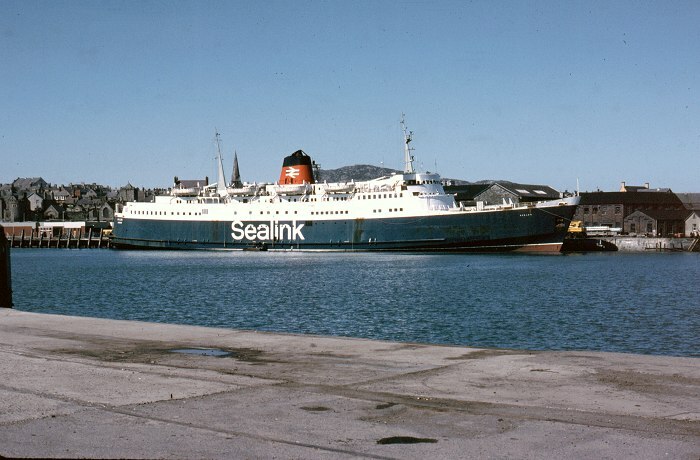 Back to the north for April 1980 - the location is Holyhead harbour, and the subject the BR Sealink vessel "Avalon". The ship is berthed on the 'town' side of the Inner Harbour, with Holyhead church just visible in the left background. 16th April 1980. Avalon was built in 1961 as a passenger ship for the Harwich-Hook of Holland route and named by the infamous Dr Beeching, in a ceremony at Harwich on July 25th 1961. When car ferries took over that route in 1974, she herself was sent to Swan Hunter on the Tyne for conversion to a car ferry. Two lower decks were converted to carry cars and a stern door was added. In this form she worked Fishguard-Rosslare from 1975. In 1979 she moved north to Holyhead, but here she was largely a reserve ship and in September 1980 she was sold for scrap, sailing to Gadani in Pakistan to be broken up in early 1981. The short career was mainly due to the fact that she was steam powered. This information comes from the www.hhvferry.com website - click here for much more on Avalon. (Text extract used with owner's permission). Much has changed at Holyhead harbour. The Inner harbour has been bridged by an access road from the new ferry terminal (on the site of the former container terminal) to the ferry berths on Salt Island. This has shortened the Inner Harbour, and boats no longer tie up alongide the railway station platforms, reflecting the complete change in the focus of the Port of Holyhead from rail-based to road-based passengers and freight.